The Four of Wands represents Chesed - the power of condensation, growth and stability, standing in the structural discipline of the 4 - the work is done, the plan was successful, the Fire has settled and reigns over its realms. 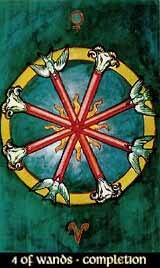 Fire is the element that stands for Atziluth, the world closest to divinity, and though the card might talk of every possible endeavour - a job, a relationship, an intellectual research, it is most likely aiming at something more spiritual. This explains the upcoming of the card in such seemingly inappropriate situations like big family troubles or failed business projects - hereby the card shows us that we've learned a lesson and that the failure in the 'profane' world was just what we needed to achieve more spiritual maturity.